Factor VII is a vitamin K dependent coagulation factor. It is a serine protease. Activation of factor VII is the first step in the coagulation cascade. Deficiency is rare and is inherited as an autosomal recessive disorder. Gene for factor VII is situated at 13q34 (OMIM 613878). The gene contains 9 exons and is 12.8kb long. Factor VII is a single chain zymogen synthesised by the liver. It has 406 amino acids with a molecular weight go 50,000. Post translation processing γ-carboxylates about 10 glutamate residues at the amino end (the GLA domain in the figure above). This allows factor VII to interact with calcium ions and cell membrane. The γ-carboxylation is brought about by a vitamin K dependent reaction (see Vitamin K and Discovery of Vitamin K and its targets and antagonists). It has two epidermal growth factor domains. The function of these is unclear. The serine protease domain at the carboxyl end confers factors VII the enzymatic activity. The single chain factor VII is activated by cleavage of a bond between arg152 and ile153. The two chains formed as a result of the cleavage are held together by a disulphide bond. The smaller 152 residue chain has the γ-carboxy glutamic acid and the larger 254kd residue chain has the catalytic domain. Factors VII has the shortest half-life (about 3-6 hours) among coagulation factors. 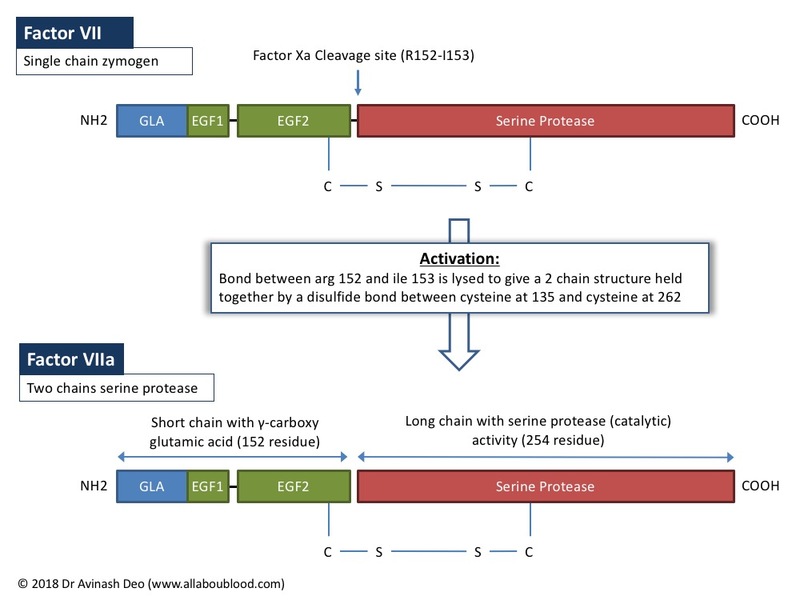 Many proteases have been shown have the ability to break the bond between arg152 and ile153 and activate factor VII. These include α-theombin, activated coagulation factors X, XI and XII and auto-activation by factor VIIa. As mentioned above about 1% of factor VII circulates as VIIa. The source of circulating VIIa is unclear. VIIa has a very poor catalytic activity and can not initiate coagulation. Tissue factor (TF) is present in subendothelial tissue. It enhances the catalytic activity of VIIa many fold. The TF-VIIa combination is the extrinsic tenase. It activates factor X to Xa initiating coagulation. The vascular endothelium prevents interaction between TF-VIIa. Disruption of endothelium allows interaction between VIIa and TF initiating coagulation at the site. Physical separation of TF and VIIa by the endothelium ensures that coagulation is only initiated when the integrity of the endothelium is compromised. The TF;VIIa combination formed as a result of tissue injury in inhibited by the tissue factor pathway inhibitor (TFPI). TFPI initially binds and inhibits Xa. The TF-Xa complex binds and inhibits TF:VIIa complex. Inherited factor VII deficiency is a rare autosomal recessive bleeding disorder. It is also seen as a part of multiple vitamin K-dependent coagulation factor deficiency. Acquired deficiency has been described in tumours, sepsis, antiphospholipid antibodies, aplastic anemia, and hematopoietic stem cell transplantation (Rev Bras Hematol Hemoter. 2015 Jul-Aug; 37(4): 269–271). Patients with factor VII deficiency have a prolonged PT but a normal aPTT. Factor VII catalytic activity should be assessed by a PT based assay using human thromboplastin. An ELISA may be performed to asses the antigen levels.